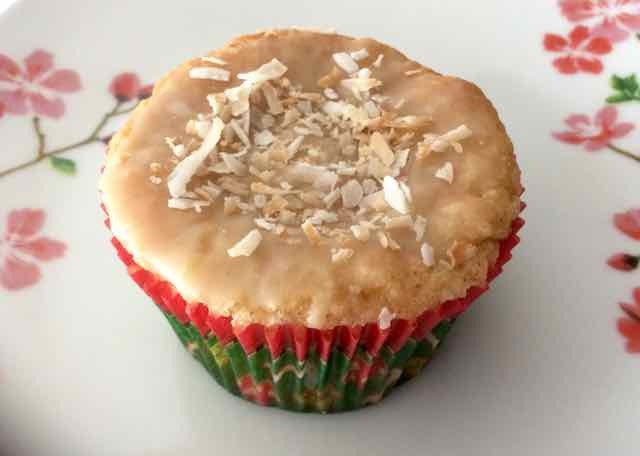 These yummy GF Coconut Cupcakes are easy to make and very delicious. The texture is fluffy and moist and they have a delicate coconut flavor. Using a glaze instead of frosting makes them just sweet enough and very easy to frost. The toasted coconut on top give them a nice crunchy bite. If you prefer you can use untoasted coconut for a crunch free texture. 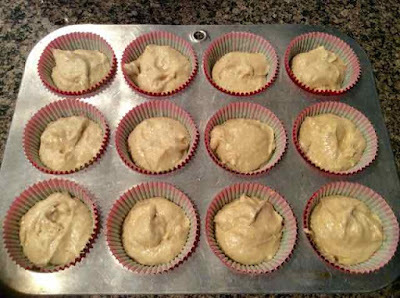 I used butter, and have not tried making these cupcakes with dairy free ingredients yet, but I’m sure the recipe would come out well. When doing dairy free baking I usually substitute half margarine and half non-hydrogenated shortening and have very good results. 1) Preheat the oven to 350℉. Line muffin tins with 17 paper liners. 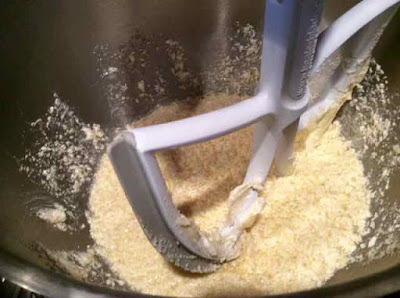 2) In the bowl of a stand mixer or in a large bowl using a hand mixer or (elbow grease) and a wooden spoon, cream the butter, salt and sugar together until light and creamy. 3) Mix in eggs, one at a time until combined. 4) Add vanilla, oil, milk & coconut and mix well. Creamed butter and sugar after the eggs and milk are mixed in. 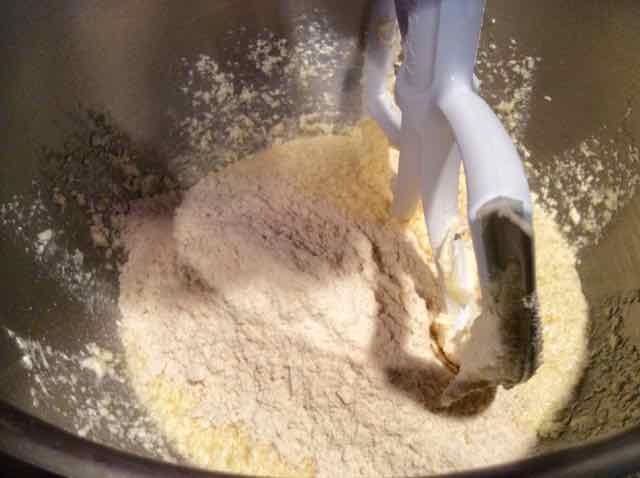 5) In a small bowl, combine the flours, baking powder and xanthan gum and whisk together until well blended. Add the flour mixture, all at once, to the butter mixture and mix until smooth. The flour mixture added to the butter mixture. 6) Using a scoop that measures 2 inches across, scoop the batter into each paper liner. The liner cups should be ⅔ full. Batter scooped into paper liners. 7) Bake for 18-20 minutes or until the cake springs back when lightly pressed with a finger. 8) Spread the ¼ cup of coconut out on a small baking sheet and place in the oven for 3-5 minutes or until the coconut turns golden brown. Remove from the oven and allow to cool. You can toast the coconut before or while the cupcakes are baking. 9) Allow the cupcakes to cool completely in a rack before glazing them. 1) Add the confectioner’s sugar to a small bowl. 2) Add the milk one tsp. at a time until a thick liquid is formed. 3) Use a teaspoon to pour some glaze on top of each cupcake and spread the glaze with the back of the spoon. 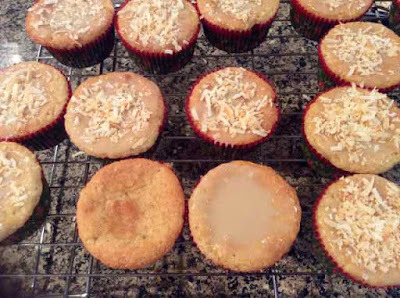 4) While the glaze is still wet sprinkle some toasted coconut on top of each cupcake. Center left front - no glaze. Center right front - with glaze. The rest of the cupcakes have glaze and toasted coconut on top. GLUTEN FREE COCONUT CUPCAKES Makes 12 - 17 Ingredients CAKE 1 Stick/4 oz./8 Tbs. Unsalted Butter 2 Tbs. Vegetable Oil - light tasting such as sunflower or canola 1 cup Sugar - I used evaporated cane juice crystals ½ tsp. Himalayan Sea Salt 2 large Eggs 1 ½ tsp. Vanilla Extract ⅔ cup/5 oz. Milk ½ cup Unsweetened Shredded Coconut ½ cup Sorghum Flour ¼ cup Tapioca Flour 2 Tbs. Chickpea Flour 2 Tbs. Coconut Flour ¾ tsp. Xanthan Gum 2 tsp. Baking Powder GLAZE ½ cup Confectioner’s Sugar 2 tsp. Milk TOPPING ¼ cup Unsweetened Shredded Coconut Directions CAKE 1) Preheat the oven to 350℉. Line muffin tins with 17 paper liners. 2) In the bowl of a stand mixer or in a large bowl using a hand mixer or (elbow grease) and a wooden spoon, cream the butter, salt and sugar together until light and creamy. 3) Mix in eggs, one at a time until combined. 4) Add vanilla, oil, milk & coconut and mix well. 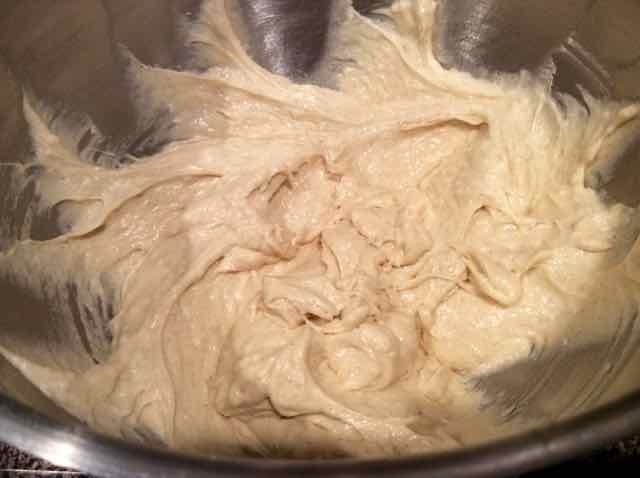 5) In a small bowl, combine the flours, baking powder and xanthan gum and whisk together until well blended. Add the flour mixture, all at once, to the butter mixture and mix until smooth. 6) Using a scoop that measures 2 inches across, scoop the batter into each paper liner. The liner cups should be ⅔ full. 7) Bake for 18-20 minutes or until the cake springs back when lightly pressed with a finger. 8) Spread the ¼ cup of coconut out on a small baking sheet and place in the oven for 3-5 minutes or until the coconut turns golden brown. Remove from the oven and allow to cool. You can toast the coconut before or while the cupcakes are baking. 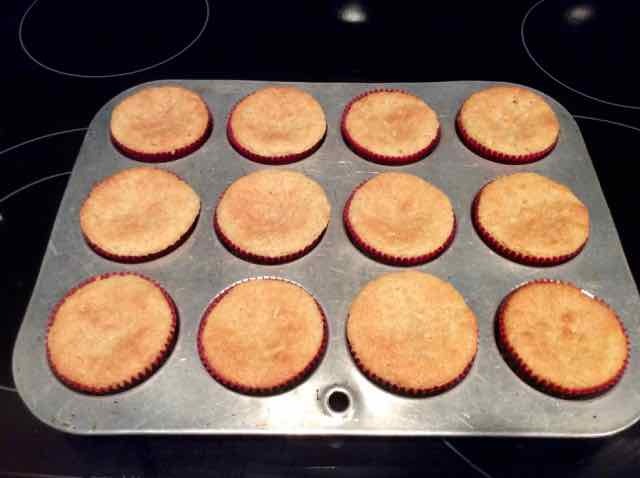 9) Allow the cupcakes to cool completely in a rack before glazing them. GLAZE 1) Add the confectioner’s sugar to a small bowl. 2) Add the milk one tsp. at a time until a thick liquid is formed. 3) Use a teaspoon to pour some glaze on top of each cupcake and spread the glaze with the back of the spoon. 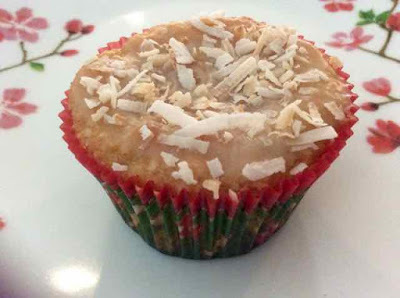 4) While the glaze is still wet sprinkle some toasted coconut on top of each cupcake.